It's almost officially summer, and the days can be hot, and many of us love beaches and water. Threadville is on the shore of Lake Erie. The Elderberry River flows behind my apartment and machine embroidery shop, In Stitches. I often walk my dogs, Sally-Forth and Tally-Ho, along the riverside trail or on the beaches. Sometimes I take my kayak way up the river, turn around, and let the lazy current take me back home. When the water's warm enough, I'll venture into it from one of Threadville's wonderful beaches. Whatever I do around water, I'm careful. Along with some of my friends, I'm a volunteer firefighter. We fight fires, but we're also among the first responders to other emergencies, and we're often called upon to rescue swimmers and boaters. Be careful out there. In boats, wear a life jacket. Swim only when and where it's safe. Wear sunscreen and a hat. Drink plenty of water. Our fire department is always willing to help, but we'd rather see everyone have a fun and safe summer. What are some of the things that you and your family and friends do to enjoy summer?Any safety tips? And don't forget to enter our Cozy Days of Summer giveaway. 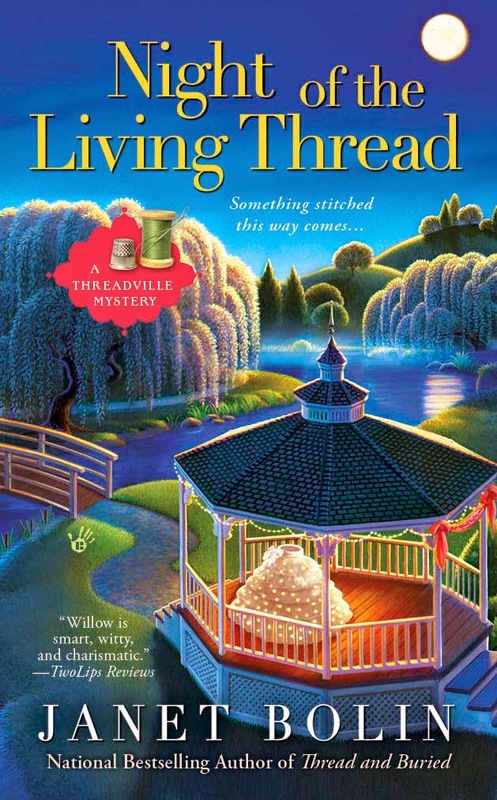 Janet is giving away your choice of any book from the Threadville Mystery Series--DIRE THREADS, THREADED FOR TROUBLE, THREAD AND BURIED, or NIGHT OF THE LIVING THREAD. Leave a comment before midnight tonight for a chance to win. At the stroke of 12:00 the next drawing begins! You can read about Willow's fire department's attempt at a water rescue and about how Willow follows an undulating trail of glow-in-the-dark thread, unravels ancient Egyptian curses, and creeps through a haunted graveyard to unearth a killer in NIGHT OF THE LIVING THREAD, available at these booksellers. Read the first chapter here. Family cookouts, canoeing, hiking in the woods. I love those things, too, DelAnne. I have read books in this series. Love the story lines and characters. As for summer activities, it would be picnics and attending various festivals in the area. I also love a vacation trip where you go some where new and see interesting things. Thank you, Dianne B! Fun things to do, too. I like to hike around Colorado Springs during the summer. It's a beautiful city and summer is a great time to get photos. Of course it's important to remember to have a hiking buddy, plenty of sunscreen and water. Beautiful area, Booklady, and great tips. I would love the newest book I've read the others. Dawn, watch your email (and check your spam filter) for a message from Janet--I've been trying to get in touch with you after you won a book when I posted the recipe for zombie cookies on Mystery Lovers' Kitchen. I'm glad I finally found your e-mail address! Grillin' on the Grill. Mowing grass, I love the smell of fresh mowed lawn. We enjoy going to parks. Tonya, you are going to get lots of requests for lawn-mowing . We like to barbecue, swim in the pool, and garden in the summer! Fun things to do, skkorman! This looks like something I would LOVE to read! Love this series! The characters are so interesting and likeable, I want to go visit Threadville. And how could you not love dogs named Sally-Forth and Tally-Ho?!? I love this series and already own most of the books in it but this latest one. I'd really do a happy dance if I were chosen to win a copy of "Night of the Living Thread"
Thank you, Petite. I agree those are fun things to do, not that we exactly have foothills and mountains very close to Threadville. But the Alleghenies aren't that far away, and they're beautiful. I love to spend time with my grandkids watching them swim in their pool. Sounds like a good series. I'm looking forward to reading it. Thanks, Rita! Lucky grandkids--a pool and a grandmother to watch them in it! Sometimes we take walks around a lake at a park near us, Usually my husband and I work in the yard, BBQ, and as a family we try to take a vacation although it hasn't worked out right the last couple of years. We have been able to get up to see family in PA.
Next time you're in PA, Debbie S., stop in at Threadville! Just finished Thread and Buried. A very enjoyable read. I'd love to read more of this series. I love BBQs, too, bn100--it's the best way to cook in the summer! SandyG265, don't you think that things actually taste better outside? This series is on my to be read pile. I love the concept behind it and have heard so many good things about it! Congratulations, Tracy! The random number generator chose you. Please contact me: Janet at ThreadvilleMysteries dot com. Thank you, Kuzlin! It's not all *that* creepy...!!! Summer time is really the only time that our six kids and their families can get together. Our tiny cabin is too small to have many people stay so there are tents and we spend a lot of time outside and we eat most meals outside. Otherwise summer is not my season! I love the tents and the cabin and eating outside. What fun! Picnics, trips to the park, visits to family, backyard barbecues, movies etc. As long as we are together it doesn't matter what we do. Carol, I love your attitude, and the fun things you do! Fun! You've given me an idea. Our volunteer fire department needs to start a softball team. I love to sit out in my backyard with a book. It is so relaxing. That and going to the beach with my friends. I'm trying to make an outdoor reading room, with hedges as walls, and space for a hammock... And the beach is fun! Good place for picnicking. I do, too. You must have been reading about the way Haylee and I shop at them. Yum! We sit out on the back deck and enjoy listening to the birds and watching wildlife meander across the lawn. I like doing that, too, but for the wildlife to meander (and not dash away) I need to leave my pets inside. I love hot summer days on the golf course---and in my back yard. I'm afraid that if the summer days are too hot, I'll stay inside with the air conditioning turned on. Naturally, my shop, In Stitches, has to be air conditioned. Sometimes, Threadville gets cooler breezes coming off Lake Erie--that's nice in the summer! Gave up camping years ago. No more reading while sunbathing either. Hibernate inside with a good book. Barbara T., I might go camping, but that sun can be dangerous, even with sunscreen. Good books are always a plan. We drink lots of water and wear sunscreen. Sunscreen is a must, of course, but I still manage to get some sunburned areas! Love to sit in a chair on the beach & read a good book. I grew up in South Carolina. Pennsylvania is a little cooler in summer, which I appreciate, and a lot colder in winter. No comment. I'm like Linda in the previous comment who enjoys the air conditioning. I like to go to festivals and play Bingo or go to the library's used book sales. I use the Internet at the library and love that it's air conditioned (I usually need a jacket!). My birthday is this Saturday, June 21, the first day of summer. I'll be going out for my birthday freebies (a meal and coffee). I have the first two books in the series and would love more. Thank you, MichelleF.! I hope you have a wonderful birthday. I love the sounds of these books. Hope I win. Thank you, Debby. We'll see what the random number generator decides. Hoping to get a bunch of reading done. Really would love to add these to the list. I would love to read the very first in this series, as I haven't read it yet. Have a great day! It's a hot one in Illinois! I go to the beach near my house for a old fashioned beach day. Tote bags. Towels . Books and sunscreen with a boogie board for the day. Thank you for the opportunity.